Let’s see what the issue is. There’s an article on Inverse (not a site I’ve come across before) that discusses how much one of Tesla’s solar roofs would cost over time. Or, rather, how much you’d make from it after the initial outlay. 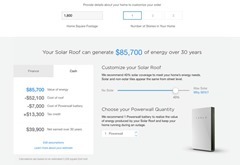 Tesla has an online calculator to help you evaluate the costs and benefits. Here’s the screenshot from that article for 40% coverage on a 1800 sq ft house in California. In other words, for an initial outlay of $59,100, you’d get a tax credit of $13,300, and you’d make $85,700 in energy (essentially, the savings from your power company) over 30 years. Ah ha, says our doofus, quoting some site about Net Present Value (NPV) together with a mathematical expression to make him look like a Real Expert, natch, this means that if you ignored the tax credit, the NPV of the whole thing over 30 years comes to -$11,788 when using a discount rate of 2%. NOT WORTH IT! Adding in the tax credit back in? A measly profit of $1,512. The calculations and results just made me go WTF? I pulled out my trusty calculator (it used to be the HP 12C, but nowadays I use an iOS calculator app): the first scenario gave me an NPV of $4,879, the second with the tax credit $18,179. Why the big differences? The total PV of those 30 “receipts”? $63,979. So, if you subtract that initial outlay, you get an NPV of $4,879. Add in the tax break at the start and you get $18,179 as the overall NPV. Of course, having said all that, we all pay our electricity bills monthly. So we should actually do these NPV calculations based on monthly savings over 360 months, at $238 per month. For that I get $5,306 NPV without the tax benefit, or $18,606 with it. Of course, now we can play around. The cashflow diagram is like a mortgage: an initial outlay (for the bank) and then receiving monthly payments to settle it. The future value (FV) after 30 years is zero: the mortgager will have paid it all off. Let’s imagine that the initial outlay is a mortgage loan, and the loan is being paid monthly from the power savings, what is the interest rate? Without the tax advantage: 2.65% APR. (It’s at this point that the incoming savings, once present valued, equals the initial outlay.) With the tax advantage? 4.72% APR. At the end of all that, what conclusions can I draw? 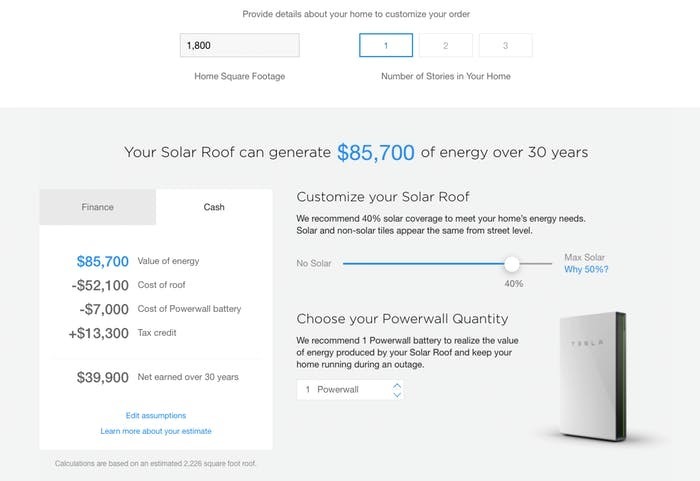 With regard to the solar roof, well, if I had the house for which the Tesla calculator made this estimate, I’m afraid I don’t have $59,100 lying around to pay for the install and thereby reap the benefits. So I’d have to get an equity loan in all probability which would skew those NPVs I just calculated. Of course, such an improvement to the house (much as a remodeled kitchen or bathroom does) would increase the value of the house by some undetermined amount as well, offsetting the costs over time. In other words, if you want it, you’d possibly make the finances work and install it. If you don’t want it, this set of (corrected) calculations is not going to change your mind.